The pelvis has been a puzzle that has consumed the greater part of my working life. The sacrum is the keystone of the puzzle, but does not function as a keystone. When the sacrum is loaded with the superincumbent weight and the joint is symmetrical, little or no movement has been observed. Measurements of movement have varied widely. The sacrum is a non-weight bearing joint that hangs from the posterior interosseous ligaments with weight loading. Movement of the sacrum on the pelvis occurs with ambulation and is moderately complex, but not incomprehensible. When the pelvis moves into asymmetry the innominate on the side of loading moves the sacrum caudad on that side, but does not move caudad on the sacrum. The innominate on the side of the trailing leg rotates cephalad as the sacrum is unloaded on that side, causing it to flex laterally toward the side of loading, rotating on a mid-sacral axis. Innominate rotation occurs on an axis through the pubic symphysis. A force-dependent oblique axis of rotation is created. The sacrum then rotates on that oblique axis to drive counter rotation of the spine to decrease the forces of loading. Static x-rays in the extreme long straddle position demonstrate the movement of the innominates on the sacrum. An error in method by an early researcher demonstrated only minute motion in the long straddle position, which has impeded further research. Pelvic dynamics has a primary effect on normal gait. The purpose of this article is to succinctly describe the normal movement and function of the pelvis; the aim is to dispel the myths that the sacroiliac joint (SIJ) has no important movement or function and that the function of the pelvis is so complex that it is impossible to describe. Salient features of the structure are described and related to movement. When the ligaments of the SIJ are loaded they become balanced and function as force couples. During normal gait, the pelvis moves into asymmetry and functions to drive counter rotation of the trunk to decrease the forces of loading. X-rays demonstrate movement in the extreme long straddle position with counter rotation of the trunk. The pelvis consists of the sacrum and two innominates. White, et al. and O’Donoghue1, 2 have described the sacrum as functioning as the keystone of an arch, however, the keystone of an arch becomes wedged more tightly as weight is applied from above. 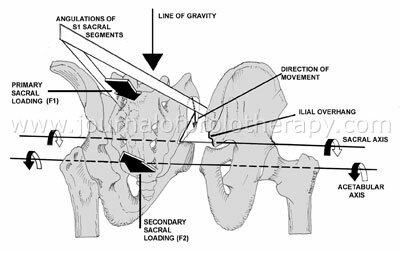 The sacrum is actually suspended from the ilia by the dense posterior sacroiliac ligaments and functions as the reverse of a keystone by hanging more deeply between the ilia with increased weight loading3-6 until it reaches its limit of motion. 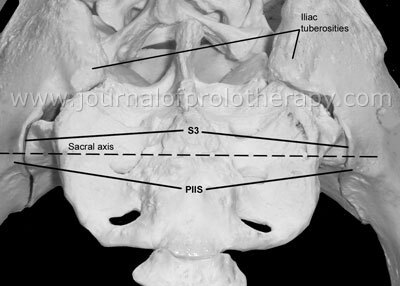 The posterior superior iliac spines (PSIS) approximate and further movement of the sacrum downward between the innominates is blocked.5 Superincumbent weight is transferred from the sacrum through the posterior interosseous ligaments to the ilia. The SIJs are inherently non-weight-bearing joints. With superincumbent weight loading Weisl6 found that the sacrum descends between the innominate bones when moving from a supine to an erect posture. This movement is in accord with Erhard and Bowling7 who stated that for all practical purposes the only motions permitted are gliding in a ventral and caudal direction and return to the resting position. Primary loading of the superincumbent weight on the sacrum is on the posterior interosseous ligaments. Vukicevic, et al. found that the joints do not approximate with weight loading as long as the posterior interosseous ligaments are intact.8 When the posterior interosseous ligaments are removed the sacrum can no longer sustain weight bearing.8 The superincumbent weight is transferred from the sacrum to the ilia through the posterior interosseous ligaments. Figure 1. 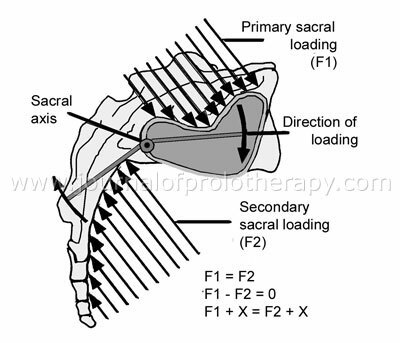 The transverse sacral loading axis. Note how the iliac tuberosities overlie the sacrum and prevent any movement in posterior rotation of the innominates on the sacrum. Take particular note of the location of the posterior inferior iliac spines. Other factors also help to decelerate the loading side prior to impact. The sacral origin of the gluteus maximus on the contra lateral side undergoes an eccentric contraction from mid-stance until impact. The triceps surae and toe flexors on that side also function to decelerate the side of loading. This action is usually mistaken for a push-off of the trailing leg, but in actuality the function is that of a decelerator.11, 13 Pierrynowski noted that sacral flexion and rotation is repeated each step and causes an oscillation of the sacrum with an increase in lumbar lordosis and the spinal curves from the sacrum cephalad.14 The spinal curves recover when the pelvis is again symmetrical at the single support phase. (See Figure 8.) This rhythmic sacrocranial vertebral oscillation was measured by Thorstensson, et al. 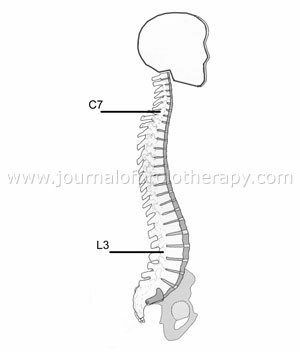 in treadmill studies and found to be about 2-2.5 cm at L3 and 1-1.5 cm at C7.15 The spine functions as a decreasing waveform to damp this oscillation in order to keep the head stable while ambulating. It appears to function as a biological image stabilizing system.11, 13 The posterior movement of the spine just prior to symmetry at single support then facilitates the hip flexors in the forward propulsion of the trailing leg. When the pelvis moves obliquely to the line of travel in order to extend the length of the stride it moves from a position of symmetry into asymmetry. This position with one leg in the extreme forward position and the other in the extreme back position is called the extreme long straddle position. Many practitioners believe that the SIJ does not move more than just a few degrees. Smidt measured up to 30° of motion in the SIJ with the subject in the extreme long straddle position. Subjects were professional gymnasts and well stretched out.16, 17 Sturesson, et al. measured a subject in that position and found movement in the sacroiliac joint of only about 5°.18, 19 In examining the method used by Sturesson, I found that he had made an inadvertent error in his positioning that was responsible for a substantial error in the amount of movement measured. Most practitioners accept Sturesson’s measurements as accurate principally because of his use of implanted tantalum balls in the pelvis. This has lead to the myth that the SIJ essentially has no movement and no important function. Figure 9. In order to view innominate movement on the oblique asymmetric pelvis it was necessary to have the front of the pelvis square to the camera, but oblique to the line of travel. Movement of the PSIS on the sacrum is obvious and much greater than reported. Clearly, there is ample movement at the sacroiliac joint and not minimal as is commonly believed. This position is clearly static. Dynamic movement would surely demonstrate greater movement than presently observed. (See Figure 10.) In order to demonstrate normal movement in the sacroiliac joint the joint must be loaded, the pelvis must be in extreme asymmetry and with strong counter rotation. If possible this should be done at the moment of impact to demonstrate dynamic sacral movement. Figure 10. X-rays taken of a pelvis in the long straddle position with counter rotation and with loading to the right and to the left. X-rays taken of the pelvis as per Sturesson had the subject with the direction of travel straight into the x-ray and with the pelvis perpendicular. (See Figure 11.) Sturesson did not have the pelvis in an oblique or asymmetrical position nor did he include counter rotation. Although his measurements were extremely accurate in this position he inadvertently measured some slight movement on the symmetrical pelvis rather than normal movement on the oblique pelvis with counter rotation. Figure 11. Position as per Sturesson. Pelvis is frontal to the x-ray and the line of travel is directly toward the x-ray. X-rays were taken of the subject in the long straddle position with loading on the right. (See Figure 12. Left side) The x-ray on the left is with the pelvis as per Sturesson, with travel toward the front, no asymmetry and no counter rotation. The one on the right is with the pelvis facing the x-ray, with the direction of travel oblique to the x-ray, the pelvis is asymmetrical and with counter rotation to the right. Clearly the x-ray on the left is symmetrical with no movement of the posterior superior iliac spines even though the subject was in the extreme long straddle position. Accurate measurements of movement in the sacroiliac joints must be done in the extreme long straddle position with the pelvis in asymmetry and counter rotation. Pay close attention to the right PSIS on each x-ray in Figure 12. Note that in the right hand figure the innominate on the side of loading rotates caudad and carries the sacrum caudad on that side. The innominate does not and cannot move caudad on the sacrum, principally because of the structural effect of the iliac tuberosities. Figure 12. In the x-ray on the left the lack of movement at the PSIS demonstrates that the pelvis is in symmetry even though the subject is in the long straddle position. Note in the right x-ray that with posterior rotation on the loaded side the innominate causes the sacrum to move caudad, but does not move caudad on the sacrum. The sacrum hangs suspended from the ilia by the dense posterior sacroiliac ligaments and functions as the reverse of a keystone by hanging more deeply between the ilia with increased weight loading. Primary loading is on the posterior interosseous ligaments with a balanced secondary loading on the sacrotuberous ligaments in the opposite direction. The force of closure at the SIJ is probably essentially nil. The balanced loading creates a force couple, which serves to decrease loading forces. When the sacrum is loaded and the pelvis is symmetrical there is essentially no movement in the sacroiliac joint. Movement occurs during normal ambulation. When the pelvis swings obliquely into asymmetry the sacrum flexes laterally toward the side of loading to create a force-dependent oblique axis. It then moves on that oblique axis to drive counter rotation of the trunk to decrease the forces of loading on that side. At least two muscles function as prime movers to reposition the sacrum to symmetry at mid-stance. Repeated sacral flexion during ambulation causes an oscillation of the lumbar spine, which is diminished as it travels cephalad. The spine functions as a diminishing waveform to stabilize the visual plane making it more stable for such purposes as hunting or observing variances in gait patterns in vivo. White AA, et al. Biomechanics of lumbar spine and sacroiliac articulation: Relevance to idiopathic low back pain. In White AA, Gordon SL (eds). American Academy of Orthopaedic Surgeons Symposium on Idiopathic Low Back Pain. St Louis, MO, CV Mosby Co, 1982, p 315. O’Donoghue DH. Treatment of Injuries to Athletes. Philadelphia, PA, W B Saunders Co, 19627. Cunningham DJ, cited by Dwight T, et al. In Piersol GA (ed): Human Anatomy, Including Structure and Development and Practical Considerations. Philadelphia, PA J B Lippincott Co, 1907. p 346. Cunningham DJ, cited by Dwight T, et al. In Piersol GA (ed): Human Anatomy, Including Structure and Development and Practical Considerations. Philadelphia, PA, JB Lippincott Co, 1907, p 346. Platt R. Pelvic technique. J Am Osteopath Assoc. 1914;14:86-88. Grant JCB. A Method of Anatomy: Descriptive and Deductive, Ed 6. Baltimore, MD, Williams & Wilkins, 1958. 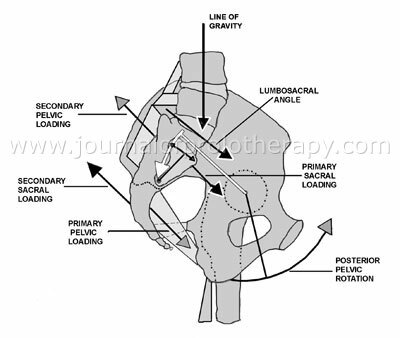 Weisl H. The Relation of Movement to Structure in the Sacroiliac Joint. Doctoral Thesis, Manchester, England, University of Manchester, 1953. Erhard R, et al. The recognition of the pelvic component of low back and sciatic pain. Bulletin of Orthopaedic Section, American Physical Therapy Association. 1977;2(3):4-15. Vukicevic S, et al. Holographic analysis of the human pelvis. Spine. 1991;16:209-214. DonTigny RL. A detailed and critical biomechanical analysis of the sacroiliac joints and relevant kinesiology: the implications for lumbopelvic function and dysfunction. In Vleeming A, Mooney V, Stoeckart R (eds) Movement, Stability & Lumbopelvic Pain: Integration of research and therapy. Churchill Livingstone (Elsevier), Edinburgh, 2007, pp 265-279. Gracovetsky S. Stability or controlled instability. In Vleeming A, Mooney V, Stoeckart R (eds) Movement, Stability & Lumbopelvic Pain: Integration of research and therapy. Churchill Livingstone (Elsevier), Edinburgh, 2007, pp 279-293. DonTigny RL. 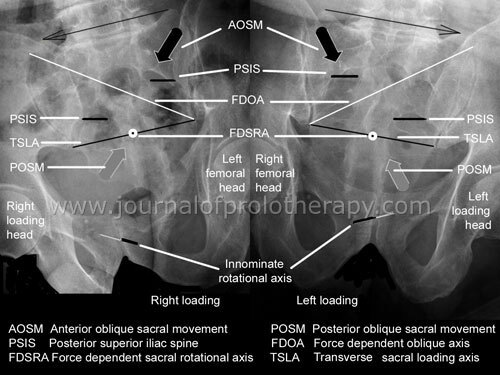 Pelvic Dynamics and the subluxation of the sacral axis. CD-rom. Havre, Montana, (c) registered 2001 and continuously revised through 2010. DonTigny RL. Function of the lumbosacroiliac complex as a self-compensating force couple with variable force-dependent transverse axis of rotation: A theoretical analysis. Journal of Manual and Manipulative Therapy. 1994;2:87-93. DonTigny RL. 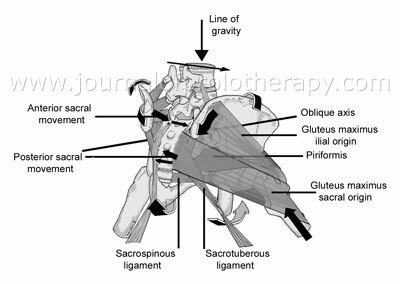 Critical analysis of the functional dynamics of the sacroiliac joints as they pertain to normal gait. Journal of Orthopaedic Medicine. 2005;27:3-10. Pierrynowski MR, et al. Three-dimensional sacroiliac motion during locomotion in asymptomatic male and female subjects. Presented at the 5th Canadian Society of Biomechanics, Ottawa, Canada, August 1988. Thorstensson A, et al. Trunk Movements in human locomotion. Acta Physio Scand. 1984;121:9-22. Smidt GL, et al. Sacroiliac kinematics for reciprocal straddle positions. Spine. 1995;20:1047-1054. Smidt GL. Innominate range of motion. In Vleeming A, Mooney V, Dorman T, Snijders C Stoeckart R, (eds) Movement Stability and Low Back Pain. The Essential Role of the Pelvis. Edinburgh, Churchill Livingstone, 1997;187-1911. Sturesson R, et al. 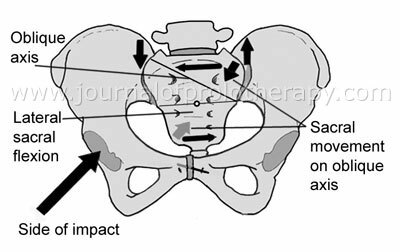 Movements of the sacroiliac joints. A roentgen stereophotgrammetric analysis. Spine. 1989;14:162-165. Sturesson B, et al. 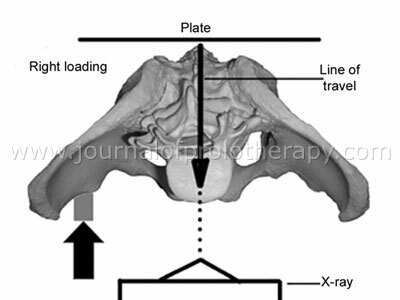 A radiostereometric analysis of the movements of the sacroiliac joints in the reciprocal straddle position. In: Sturesson B. 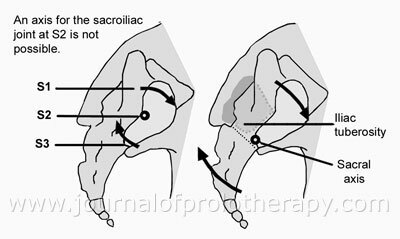 Load and Movement of the Sacroiliac Joint. Malmo, Sweden, Rahms Tryckeri i Lund AB, 1999;75-79. The author is grateful to Eric Wilting, John Rosenbaum and the Radiology Department of Northern Montana Hospital for their expert assistance. function, movement, normal gait, sacroiliac joint, Richard L. Dontigny, PT, Volume 3 : Issue 1 : February 2011, Wonder Why?